KAGUYA (SELENE) SELENOLOGICAL AND ENGINEERING MOON EXPLORER. THE " KAGUYA " LUNAR ORBITER IS A LUNAR PROBE LAUNCHED BY THE JAPAN AEROSPACE EXPLORATION AGENCY (JAXA) ON SEPTEMBER 14, 2007. THE MAIN OBJECTIVES OF THIS PROYECT WERE TO ADQUIRE SCIENTIFIC DATA FOR THE PURPOSE OF CLARIFYING THE ORIGIN AND EVOLUTION OF THE MOON AND TO CARRY OUT VERIFICATION OF POLAR LUNAR ORBIT INSERTION AND ORBITAL ATITTUDE CONTROL TECHNOLOGY. 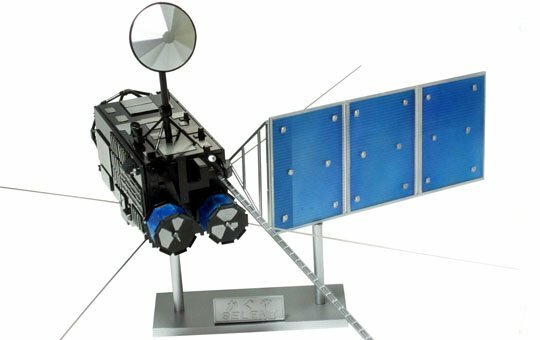 KAGUYA INCORPORATED 14 TYPES OF MISSION OBSERVATION EQUIPMENT AND CARRIED OUT THE LARGEST AND MOST SOPHISTICATED EXPLORATION OF THE MOON SINCE NASA APOLLO PROGRAM. IMAGES CAPTURED USING HIGH-DEFINITION TV CAMERAS. KAGUYA MADE A FINAL OPERATION CONTROL DESCENT MOON SURFACE ON JUNE 11, 2009. ALONG WITH 410,000 JAPANESE PEOPLE MESSAGES. TODAY KAGUYA STILL REMAINS ON MOON SURFACE.